At Outskirts Press, Inc., we take great pride in celebrating the work of our successful self-publishing authors, and we do so each week through our Self-Publishing Author Spotlight. This week we highlight self-publishing author Peter F. Warren, who has published 3 successful titles with Outskirts Press. Peter F. Warren Peter Warren is retired from the Connecticut State Police Department. Retiring at the rank of Major, he served as the commanding officer of several specialized units. An Honor Graduate of the CT State Police Academy, he is also a graduate of the University of New Haven, and of the FBI National Academy. He is also the author of two Civil War books. Currently, he resides in South Carolina with his wife. Paul Waring, a retired state trooper from Connecticut, is recruited by his friend, Captain Bobby Ray Jenkins, from the Georgetown County Sheriff’s Department, to help solve a series of brutal murders that continue to occur between Myrtle Beach and Georgetown. Can Paul’s expertise help stop the murders before the killings continue? Why has Georgetown been selected as the dumping ground for each of the victims? Missed payments and the issuing of several bad checks have previously led to arguments and bad feelings between five young men and someone they know. Now, on this hot and humid June afternoon in South Carolina, it has led to their deaths; deaths caused by someone they trusted. In a fit of rage, their killer has executed each of the three tenants who have rented the beautiful home near the beach in North Litchfield, SC. While each of the tenants have been executed by being shot at least once in the back of their heads; some with their arms and legs bound behind them, and their mouths taped shut to prevent them from being able to scream out, so have two of their closest friends. After being killed, the killer has set three small fires within their home in an attempt to destroy any evidence that may have been left behind. Called out of retirement for the third time, Paul Waring, a retired state trooper from Connecticut, is asked to head the investigation into the deaths of these young men. 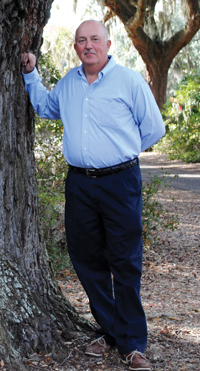 An experienced homicide investigator for many years, he has been asked to do so as his friend, Captain Bobby Ray Jenkins, the head of the Georgetown County Sheriff’s Department’s Major Case Squad, is out of work due to recent back surgery. With Lt. Audrey Small, Jenkins’ assistant, soon to be married, Paul is asked to take over an investigation that has been slow to start, and troubled by mistakes. Confronted with a series of issues and problems, including a prosecutor who is questioning his involvement in this investigation, Paul must rely on all of his investigative skills and experience to find out who is responsible for committing these horrific murders. With one victim already brutally and senselessly murdered in Murrells Inlet, the Georgetown County Sheriff’s Office is then confronted with another very similar murder days later. As Paul Waring, a retired state trooper from Connecticut, is again called in to help investigate these murders, a third victim—a Catholic priest—has been found shot inside a church in Pawleys Island. But why? Two days later, a tragedy involving Paul’s family occurs in nearby Garden City. Is this latest incident an attempt to discourage Paul from working these three murders? A suspenseful and exciting series of events connects each of these murders together. Then, as Paul and his fellow cops begin digging for answers, they learn their suspect has plans to blow up the Myrtle Beach Convention Center. Is a symbol from the past really the cause behind all of the mayhem that has staggered the Grand Strand? Next Next post: Support Our Veterans This November 11 by Reading Their Books!